Immediately upon his return from the service in 1946, Enos Slaughter led the National League with 130 RBI and led the Cardinals to a World Series win over the Boston Red Sox. In the decisive seventh game of that series, Slaughter, running with the pitch, made a famous "Mad Dash" for home from first base on Harry Walker's single in the eighth inning, scoring the winning run after a delayed relay throw by the Red Sox' Johnny Pesky. This play was named #10 on the Sporting News list of Baseball's 25 Greatest Moments in 2001. 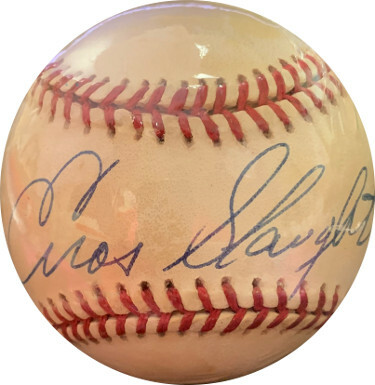 Enos Slaughter has hand signed this Official American League Baseball. Certificate of Authenticity from Athlon Sports Collectibles. Toned as shown, sold as is, no returns.